Nature is still active at Camp Bethel! The fall months have brought us another friend! As full time staff we often enjoy walks around camp to witness the beauty that comes with the changing of the seasons. 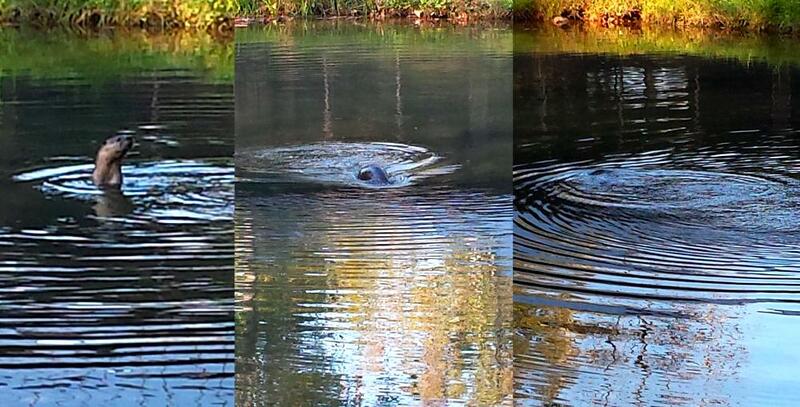 While walking by the Spring Pond one morning (October 17) Beth spotted a River Otter playing. We assume that the otter was enjoying the many trout that were stocked into the Spring Pond for Heritage Day. At a later point that day I was also walking around the Spring Pond and was able to catch sight of the River Otter playing. As I stood in the grass and watched the otter swim around and play we would lock eyes every now and then, all the while I was using my handy dandy smart phone to capture the otter's photo. It was as if the otter knew I was watching and was intentionally putting on a show: a very elegant show, as the otter was able to smoothly move around in the pond. - River Otters are usually 3-4 feet long and weigh anywhere from 11 to 30 pounds. - They eat a variety of aquatic wildlife such as fish, crayfish, crabs, and much more! - River Otters like to live in dens that are along the water. Often abandoned burrows or empty hollows. - When River Otters dive they close their nostrils to keep water out. They can stay underwater for up to eight minutes. - River Otters have thick, protective fur that helps keep them warm while swimming in cold waters. This is probably very necessary for swimming in the Spring Pond.